I haven't always had good luck with limited edition flavors of Choco Ball, but look how cute this little box is! I couldn't resist it. Plus, I had been craving anmitsu all summer. It wasn't that I thought these would taste like a bowl of anmitsu, but maybe they would remind me of it. Anmitsu is, after all, a bit of a pain to make. It's a beautifully arranged dessert with fruits, rice dumplings, jellies, ice cream, and red beans, all topped with syrup. It requires a lot of preparation, though it is refreshing, delicious, and probably worth the effort. I've never made it myself. As soon as I unwrapped the plastic, there was a strong fruity smell coming from the box. I wasn't sure what fruit, maybe cherry or melon, but it wasn't entirely appealing. 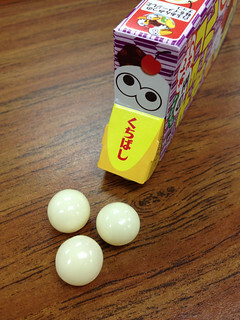 The white coating was sweet and a bit creamy, more like candy melts than white chocolate. It didn't have much flavor. The center reminded me of both agar agar and mochi - it was tougher than either, more like a gummy candy. The flavors inside were slightly reminiscent of azuki (red beans), but for having such a strong scent, it only tasted vaguely fruity. 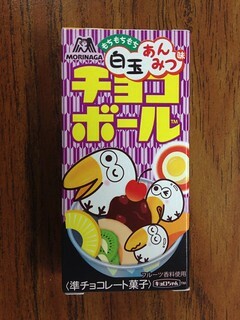 Together with the coating, I got a weird, syrupy flavor that was sort of like anmitsu. I wasn't expecting a perfect replica, but these just weren't great.